I’ve wanted to post about what Jimmy and I use and love for our pets for such a long time, and I think I’ve finally gathered together all of my thoughts. Once I started writing this post I realized I’m going to need to split everything up into seperate posts or else this would be one long post. So, let’s start with our favorite dog puzzles and toys and be on the lookout for our favorite cat puzzles and toys in my next post! I kept reading great reviews for this toy and didn’t understand what the fuss was about until I bought it and saw how much Mavis loves it. Basically, you can put the squirrels in the holes of the “tree trunk” and your dog figures out how to get them out. She thinks it’s so cool to pull the squirrels out. I also see her just playing with the squirrels a lot, too. If your dog is a fast eater, I’d recommend this feeding puzzle. You put food inside the holes and the base of the puzzle spins. Your dog first has to open the flaps and then spin the base of the puzzle to get all the food out. It’s a great way to get them to use their mind to work for their food. You can see Mavis figuring out this puzzle around the 5:00 mark in this vlog. The KONG is such a great toy for feeding treats to strong chewers. I usually spoon peanut butter into a KONG and stuff a treat inside to make it harder. Lola and Mavis then have to use their paws and tongues to get the peanut butter and treat out. It takes them a good 15 minutes or so and they love it. If you really want to make it last longer, you can freeze the KONG with peanut butter inside. Other fillings you can use are apple sauce, bananas, and the KONG Easy Treat (it basically looks like Easy Cheese spray and is a lot less messy than using peanut butter!). This was another toy that I didn’t get what the fuss was about until we tried it ourselves. This is definitely Mavis’ favorite toy. She loves to play fetch with this ball and sometimes I stuff pieces of old t-shirts or rags inside it with treats rolled in them and she gets to “destroy” the toy by ripping the t-shirt and rag strips out of the ball and eating the treats. If your dog likes to rip apart toys, I’d recommend this toy with the t-shirt and rag strips idea. The ball comes in different sizes and there’s also an extreme version for heavy chewers. This is actually a toy that my brother’s golden retriever, Jax, loves. He’s obsessed with playing frisbee and usually destroys frisbees pretty quickly. He once cut his tongue on a plastic frisbee and that was a bit of a disaster. This frisbee is soft, flexible, and designed to fly well. I can’t wait to see if Mavis will play frisbee once it warms up outside! This is a bit of a challenging puzzle, so I’d only recommend spending your money on this one if your dog already has shown interest in puzzles and enjoys them. This puzzle has sliding discs, levers, and cones that need to be moved or lifted in order for your dog to get their food or treats. Mavis and Lola both love this puzzle! Trixie also has other levels of puzzles that are more or less difficult than this one that I’d recommend checking out! This is a puzzle feeder that we use multiple times a day in our house. It comes in small or large sizes (we use the small for Mavis and the large for Lola). You unscrew the ball and put dog food or treats inside and then twist it back together. The top and bottom of the ball have holes that you can customize the size of (by cutting little rubber nubs) based on your dogs kibble size or how hard/easy you want to make it. Your dog then has to roll the ball in order to dispense their food or treats. We use this for at least one meal a day for Mavis and Lola and it takes them about 30 minutes to finish their meal plus they have to walk around to get their food out, which gets them some extra exercise. Bonus: it’s also dishwasher safe! Has anyone given their dog an elk antler? Our dogs love them but man are they expensive! This is a cheaper alternative to an elk antler and is made of real dogwood. I have no idea why dogs like to chew dogwood, but ours really enjoy this! It doesn’t splinter like a simple stick would and comes in different sizes and flavors. I keep one in our house and one in my truck for Mavis to chew on while we drive to pet sitting jobs. She gets to excited to get in my truck because she knows her dogwood stick is in there! So, there you have it! 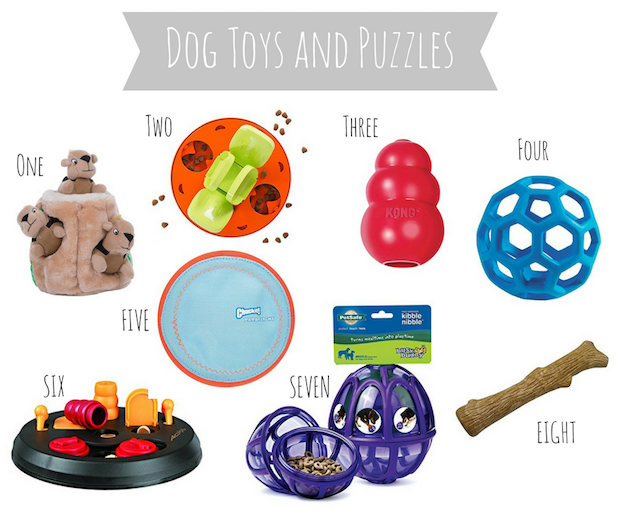 Those are some of our favorite dog toys and puzzles. I could have listed about a million more, but I tried to pick our absolute favorites and have good variety for dogs that like to chew/fetch/solve puzzles/etc.! Your dogs live the good life! Fun stuff. They really are so spoiled!! I bet your friends and siblings LOVE how much you spoil your nuppies, haha!! Love that word! Oreo chewed apart so many Kongs that we eventually had to get him the Kong Extreme Black. It’s the only toy he’s ever had that he hasn’t completely destroyed. It does have some good wear on it, but it has actually last over a year so that’s really impressive for him. Most things (even ones made for “extreme chewers”) he can chew through in an hour. He’s kind of a beast, haha! I’m going to look into the dogwood stick, though. I bet he would like that! Wow, Oreo is quite the chewer! I have only met a few other dogs like that and their owners have always had good luck with the Kong Extreme products! I hope Oreo likes the dogwood stick if you give it a try!